This is a short video of several clients at the studio performing Intervals called "Zoomies". Zoomies are 8-second intervals, with just 6 second recoveries. We performed FORTY of these in 3 sets. The goal is to ride the 8 second intervals at a relatively high intensity, maybe 150-200% of Threshold. Then the cyclist spins through a short recovery. I used it on Tuesday, and multiple cyclists achieved breakthroughs on Xert. I'm using it today as well, to similar effect. These also make for GREAT simulations for Crit or Cyclo-Cross bike races. In those events, athletes are forced into short, sharp, hard intervals, with minimal recovery. Ironically, we were supposed to perform 13 minute and 8 minute Critical Power intervals to try and determine Critical Power and Anaerobic Work Capacity today. However, these "Zoomies" have led to multiple fitness breakthroughs for average power on PerfPro Analyzer. One of my clients, James, is using a Moxy Muscle Oxygen Monitor, and our goal for him is a bit different. We are trying to get his SmO2% down into the single digits, which is REALLY HARD. At the same time, I am watching his Total Hemoglobin, which hovered in the low 12's for about 45 minutes. It now is down at 11.95. Why? Well, he's running out of blood and muscle sugar, and a carbohydrate drink might be appropriate right now. I'll post screenshots in a bit. What's also interesting is showing how quickly (or not), his SmO2% rises after an interval set. If it gets back up into the mid to high 80's for him, that's when it may be an optimal time to ingest more carbohydrates, OR drink a recovery drink. If you want to get fit for cyclo-cross season, or maybe just enjoy some overall strength in your fitness, give these a try. You can also perform these intervals outdoors, racing from telephone or light pole to the next pole, and then recovering. Repeat to exhaustion, or until you run out of space! I frequently get this question. "What's on your Garmin?" "What's on your Screen?" "What do your Profiles look like?" How do you set up your Xert Training Fields, and in what order? Xert Training Fields Garmin 1000 Screen 1. Screen 2 of my training profile. This Screen is getting more esoteric, but What's my FTP field is on there. My Xert Interval Training Screen. But the truth is that Xert Fields work best in different settings and locations. It's a bit complicated, but hopefully this post and the next few will help. Garmin Profiles - Don't Get Distracted. Garmin cycling computers have a LOT of options and features. My favorite is the Custom Profile. You can go into setup, build a profile, and have it as complex or simple as you want. There are pages, fields, even colors. Furthermore, with Connect IQ by Garmin, there are literally THOUSANDS of custom fields and apps that can provide useful information. This post will focus on Xert fields when I'm training. It's what I look at when I'm riding indoors and out. Let's start at the VERY, VERY beginning. I'm going to use a Garmin 1000 screen. It's what I own, and I'll add recommendations for the Garmin 820, 520, and 1030 when I get screen shots of them from clients. We're going to download the Xert Fields, make adjustments in setup, and then install them in locations and pages on a profile. First - well, we turn on the Garmin, and let it cycle through its' startup. ****BEWARE! GARMINS ARE VERY TOUCHY COMPUTERS! I recommend that you let the computer run through everything and then settle in on the home page before trying to do anything with it. If it prompts you to upgrade the firmware, make sure you do that at some time when you are NOT planning on riding! Firmware updates are good, but they can take time. Map upgrades can take HOURS. Like any other piece of tech - be prepared to spend time with it when you're uninterrupted. I'm going to assume that you're familiar with Garmin Express, but if not, here are some screenshots of Garmin Express. I prefer Garmin Express and a wired connection. You can also use Garmin Connect through your Smart Phone. Let's begin by looking at all of the Xert and Baron BioSystems Apps that are available, and installing them properly on the Garmin Edge. Let's click on "IQ Apps". Garmin Express Connect IQ Apps Screen. Now, let's stop and take a look at the Drop-Down menu. It's important to discern a few things. Garmin Fields Vs. Apps Vs. Widgets, Explained. There are five options in this drop-down menu, but let's explain the bottom three items first. A DATA FIELD is a custom field that works with the rest of the fields on the Garmin. It occupies one space. 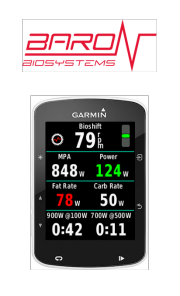 Fields use the data coming in from the Garmin's sensors, like Speed, Cadence, Power, and HR. A Garmin APP, effectively takes over the entire brain of the Garmin Edge, and uses the sensor information in its' own way. There is currently one Xert APP. Garmin Widgets are similar to Fields, but they tend to take data from your phone or Wi-Fi, and display it in the field. NavMin, which is a widget used to create maps for export to TCX. Xert Fields show up after a search in the Connect IQ search bar, but remember, the XERT PLAYER is an APP, and not a FIELD. Xert MPA and Power Field Window in Garmin Connect IQ. This is my absolute, all-time, go-to, first field. It's the CORE of XERT. You can do SO MUCH with just this Field alone. Click Download, and then let's proceed. ***PS - You'll need your Garmin Email and Account Information! For the sake of simplicity, GO AHEAD AND DOWNLOAD ALL OF THE FIELDS. DON'T FORGET TO INCLUDE "BIOSHIFT" AS WELL. That's a total of EIGHT FIELDS. Garmin 520 owners and some of you Fenix Owners, well, you're limited to 4 Fields on one profile, and two fields on one profile. When you see how I set up my own and my clients' fields, you may want to consider an 820 or 1030. Oh - and no one's eyesight is improving as we age. No one's. Once you've downloaded all of the fields, your Garmin Express screen will look something like this. Use the "DATA FIELDS" drop-down. These are my Xert Training Fields as seen through the Garmin Express Program. As of this publication, Project Jaguar is a Beta Field, and is not active. I'll write up a separate post about that soon. MPA and Power - Xert Settings. Use a Rolling 3-Second Power Average, because that's roughly one respiration cycle. There's not much to program here, just enter your Xert Username and Password, and set "Power Average Time" to 3 Seconds. Why 3 seconds? Because it's roughly your inhale/exhale average cycle. Click 'Save', and let's move on. I have NO IDEA why anyone would prefer "Watts" of Fat and Carbs vs Tenths of a gram. Now, I'm going to dip my toes into some controversy here, but it's my blog, and I've seen enough to know what I'm talking about. DITCH XEP. REPEAT. DITCH XEP. REPLACE IT WITH "Difficulty Level." Notice how I've slid "Show Difficulty score in place of XEP." over to the "ON" position. Why? Well, let's have that discussion. XEP stands for "Xert Equivalent Power". It's a type of average power that is based on Strain, Stress, and metabolism. BUT, and here's my problem with it..... It keeps the Zeroes in the calculation. Now, when you coast, it's going to lower the average. My comment about this is, well, your heart still beats when you're coasting, and when you're stopped. If you want a metabolic average power, then get rid of the zeroes. It's not that XEP is not accurate, but I really wish that XEP was it's own field, and that it had the option for the slider that is underneath, which is, "Reset on Lap". If I had XEP that could reset on a lap, then I could arguably train for intervals better, because God Knows I'm not going to coast through an interval, right? But they're paired at the hip for now, and XSS is more important than XEP anyway. Switching to "Difficulty Score" is also useful, because it gives you an idea of just how "hard" a ride may be. Difficulty level is based on Strain per hour, so it also floats up and down, but is arguably easier to understand. Click "Save" and let's move on. Focus and Strain Fields are a really strong tool for cyclists out on training rides. Now, let me be the first to tell you - I LOVE "Focus" and "Strain". Why? Well, they're crucial elements to your overall training picture. I've written about this before, but "Strain" is how your body responds to "Stress". When you ride, you use energy, and "Stress" is measured in KiloJoules. "Strain" is the physiological response. Having "Strain" on-screen allows you, if you know what you're looking for, to get adequate value out of a ride, just on strain alone. Likewise, when you ride, you want to keep "Focus" in mind. "Focus" looks at "Strain" intensities - all the highs and lows, the ups and downs of wattage generated during a ride, and it basically says the following: "Thus far, all the Strain Kilojoules you've used, in Low, High, and Peak intensities, has led the "FOCUS" of the ride, to be at, "X" minutes and seconds. The more Stress you build up, and the more strain you build up, the less sensitive "Focus" gets. This is a GREAT way to go out on a three-hour jaunt, let's say, and just ride for a "Focus" of, say, 6:00 minutes, and earn at least 300 Kj's of Strain. That's just one example, but it's good to keep Strain on the screen, and let both fields accumulate over the course of the ride. Therefore, keep "Reset on Lap" OFF. We will discuss the COLOR of FOCUS later (I wrote a blog post about that as well, I think), but for now, just click "Save", and continue. This is a simple Field, but it's fun, it's useful, and it doesn't require a subscription to Xert. This is another really useful field, as long as you employ it correctly. FTP stands for "Functional Threshold Power'. There are a MILLION definitions of this value, but my own, Single-Malt-Scotch-Distilled version goes like this: "Below this number (in Xert, or Tpeaks, or WKO, or RaceDay Apollo, or whatever other analysis software strikes your fancy), you're "AER-O-BIC", and you can ride "For a Really Long Time". ABOVE this number..... You're on BORROWED time, and you're only going to make it for a few minutes at most. Still, it's good to know WHAT that number is, and that's what this Field offers. As you ride an intense effort, it generates a ring that goes around, like the Second hand on a clock, and the colors change. Once it's made one revolution, the number in the middle, your "FTP", starts to rise. When you quit from exhaustion, the number that you see is theoretically pretty close to what your FTP should be. DO NOT have it reset on laps, unless you know what you're doing. Leave everything else off as well. Click 'Save', and let's move on. Nothing to see here for programming, except that it's just an AWESOME FIELD and IT REALLY, REALLY works. I don't know how, but it's got code that is uncanny. This COULD be a Useful Field, but it's NOT easy to understand, and I do NOT recommend it for anyone other than advanced users. Now, this Xert Training field can be used in MANY different ways. "If you set this value to 500 (or whatever), and you then HOLD that value when pedaling, it will count down the time you have available until your MPA reaches 500." "IF YOU RIDE AT 0 Watts (or whatever), as a recovery wattage, the "Time-To-Recovery" value will count down until you've reached your Peak MPA once again." "First - Set your TTE Watts to a training intensity, say, 500. Then, slide the next field option to "ON". Third, Set a "Target MPA" of, say, 700. My Peak Power is roughly 1250 watts, so 700 will get me down to a pretty low value, but it will still keep something in reserve, and 500 watts is pretty damned intense. Fourth, set "Time-to-Recovery Watts" to, oh, 80 watts. I don't live anywhere that I can coast at zero watts, but I can ghost-pedal at 80 watts and still get my legs and lungs back. Fifth, Slide "Use Custom Target MPA?" to "ON"
Sixth, set a "Target Recovery MPA" value to, oh, let's go with 1000. That should give me enough time to recover, but I'll still have to hammer out at 500 watts to get back down to 700 MPA. What this function performs is that it creates an MPA "Floor", and an MPA "Ceiling", as well as a goal wattage for the effort, and the recovery. It's a Simple Interval-Builder. You can bounce from floor to ceiling, floor to ceiling, until you're completely exhausted. The problem is that it requires programming, a knowledge of how capable you are, and how long you think you can hold an effort watt-wise, without blowing up too early, or too late. Now, it can be useful for things like Time-Trials, where you'd set a goal wattage to maintain, and would then set recovery to 0, and ignore the MPA settings, turning those 'OFF'. But I'm honestly not the biggest believer in flat intervals. They're not terribly real-world, and Xert users can get more out of their training, by using the other fields instead of this one. Feel free to disagree, though, and certainly leave your comments below. We're almost done with the hard stuff, and we're about to get to the Profile itself. Hang on. Once you have finished programming the fields with your own Username and Password, and you've turned the options on and off to your liking, then we get to put them in the memory for the Garmin. When you click on the drop-down menu on the upper right, your Xert Training Fields will show up. ALWAYS hit the "HOME" icon in the upper left after messing with Fields, Widgets, or Apps. When you're done programming in the "DOT DOT DOT" areas, scroll up and down, to make sure you have all the Fields you're looking for, and then ALWAYS, hit the "Home" icon in the upper Left corner. In fact, I usually do it twice before disconnecting my Garmin. If you get the "Changes Saved" green bar, it should be good to go. PART II - Building an Xert Training Fields Profile. Now, this is NOT a Racing Profile, it's a TRAINING Profile. It's also not an ADVENTURE Profile, which would require using some "RideWithGPS" downloads. That's another topic for another day. Garmin 1000 Main Page. Click on the Screwdriver & Wrench icon on the lower left. Current Profiles in my Garmin 1000. There's a "+" button to add a profile. Press that button. Press the "+" button. It will create a new profile. Press 'Name', and give it something Original. Press 'Name', and for this exercise, I'm going to call it 'Xert Blogpost'. Also, change the color. Orange is one of the colors in my studio, and it stands out. Now, go to "Data Screens". Let the fun begin! I prefer 5 fields, but I'm also going to build for six, and put all of the useful Xert Training Fields on one Screen. Press the 'Check' button, and then press the TOP FIELD. Press the Top Field for a second, and you'll get the Field Options Menu. You'll get the 'Field Menu'. Press 'Connect IQ'. Press 'Connect IQ' and you'll see all of your Xert Fields. Your Xert Training Fields are in here. Let's start with "MPA and Power" (Not Shown - just arrow up or down to find it). When you press 'Xert: MPA and Power', will show up in the first field. Now, let's just go down the list, and add them IN THE FOLLOWING ORDER. BioShift is going to be a little hard to read down there, which is why I like the 5 field limit, but let's continue. Finish it off with the "What's My FTP?" Field. These are the six Xert Training Fields that I use most. Now - NONE OF THESE are populated. Press the "CHECK" box, and let's get out of setup. This is more to my preference, just five Xert Training Fields, but it excludes "What's my FTP?" I usually place that on another page, which you can see way up at the top of this post. Xert Blogpost is right in the middle. It's a Profile with One Screen. Hit the back arrow, and get back to the Main Menu for the Garmin. Use the left and right arrows to get to your custom profile, and when you're there.... press 'RIDE'! Voila! Your Xert Training Fields are up. Make sure your phone is connected to the Garmin, so that when you hit 'Start', the Orange Dots on the left, will update with the latest information in your Xert Signature, and they'll turn green in the first few minutes of a ride. Your MOST ESSENTIAL Xert Training Fields Data is there, on one screen, and in a particular order. Why this order? Well, let's look at that, real quick. MPA and POWER: You need to look at power because, well, you're a nerd like the rest of us. It's COLOR CODED, and when it turns certain colors, MPA will decline. When it turns certain other colors, MPA will rise or maybe even not move at all. Still, this is a TRAINING profile, so think COLORS of the WATTS. FAT and CARBS: Now, personally, I would prefer to have these reversed, so that FAT was directly under POWER, but it's not a big deal. What IS a big deal, is that here, you have TWO of the main elements that make up some of your MOST CRUCIAL TRAINING; The "Green/Red" Ride. What does that mean? Well, when your WATTS are colored green, and your FAT is colored red, well, you're riding PRETTY AEROBICALLY. These "Green/Red" Rides make up a LOT of a cyclist's training, and are the most accurate way I know of to demonstrate and display one-half of the "Polarized" training technique. Likewise, if you start increasing intensity, your "CARBS" will start shooting up, and you need to think about replenishing those in a timely fashion. One more treat: If you're looking to lose weight, and your Signature is accurate, well, burn the FAT grams, and don't replace them. Eventually, something will happen. FOCUS and STRAIN are some of my favorite fields as a coach. I can use FOCUS to help athletes GOVERN a ride, or determine just what type of training best suits a ride or race. If FOCUS changes colors, then I know just how, well, "Focused" the "Focus" was. As for STRAIN, well, when you look at the chart on Xert, and you start to think about how STRAIN is necessary for adaptation, you can set minimums and maximums for a ride, or start making comparisons between Focus, XSS, and Difficulty. It helps with Intuition. XSS and DIFFICULTY are useful because I like to see myself and my clients achieve scores, set floors and ceilings, and once again, using Difficulty, determine and intuit just how 'Hard' or 'Easy' a ride may or may not be. XSS and Strain only go UP. Focus will rise and fall, but will be less sensitive over time. Difficulty will also rise and fall, and will be less sensitive over time, but it can give you another 'value' for an overall effort. BioShift - I LOVE THIS FIELD! HOLY MOLY DO I LOVE THIS FIELD! I think it is GENIUS! For years, we've tried to look at that "Gear/Cadence/Slope/Power" combo, to come up with a formula that works and tells you, "You need to be HERE with that power and that slope, and maybe even that speed." I don't know how Xert/Baron BioSystems does it, but it's UNCANNY. Use it, make it bigger with fewer fields if you need to, and keep that bar in the GREEN! Now - WHERE IS 'WHAT'S MY FTP?" Well, if you want it, it's on Field 6. But if you look up at the top of this post, you'll see that I placed it on another screen entirely. Why? Well, FTP is important, but it's not critical to a TRAINING RIDE. A TRAINING RIDE uses POWER, to set a Pre-Determined FOCUS, achieving a floor or ceiling strain, a minimum XSS, and maybe a certain amount of Fat grams, or overall KiloJoules. I've placed a TON of information on the other screens. I even have a "Lap" screen, using some more Xert Fields, along with some non-custom fields. You may also see that I tinker with the Moxy Widget; it's another tool for training. But the core elements for Xert are here. I'll do a separate blog post on TTE and TTR, and will show you a workout that uses it. But for now, let's go with this. I know this has been a long post, and I know that the Garmin 1000 is no longer available. The post took me about four months to write. I wrote versions of it over a year ago. A lot has changed, but these are the fundamentals which I believe will help you get the most out of Xert, for every training event. I Just wanted to give you a heads up on what I'm looking at in terms of your Xert progression. This is a NICE CHART OF XERT PROGRESSION. It's safe, it's consistent, and it's predictive. The Form line is just a hunch right now. As long as you feel okay, we continue. There are no signs of overtraining. Xert XPMC Chart Shows nice progression, breakthroughs, and a Plateau'd form line, which is just fine for now. IF we were looking at the ATA, well, it's pretty much spot-on. You're right on the edge of "Training" and "Training Optional", and the Xert Progression future workout is arguing for something a little less intense. We'll see about that. I don't agree or disagree, but the physiological modeling is rolling parallel to what I'm providing as a coach. However, we communicate more effectively, and we also know when you're feeling good enough for a breakthrough, when the model might say something different. IF you follow the Xert Training Pacer, which is kind of a broader coaching tool, it correlates with what we are seeing in this discussion. Xert Stress Chart Shows healthy growth, but also shows the limits of indoor training. This will rise once the weather turns and you're able to get Green/Red rides outside. STRESS continues to trend upward. You and I know that a good hour on the bike can use as much as 800-1000kj's, and we're S L O W L Y going to work our way up for that. Still - I like seeing this growth. It's going to lead to a great aerobic engine. This is one of my favorite Xert Progression charts; we know how much energy it takes to ride, and here, we see it in a rolling average. Strain is showing that the quality days are HIGH QUALITY, with a nice High Strain Purple Marking, whereas the Green/Red and Recovery days are all pink, which is exactly as they should be. Those are also mostly lower strain overall. As for Strain, well.... The QUALITY days are QUALITY! HIGH QUALITY! AWESOME QUALITY! LOOK AT THE PURPLE MATCH HEADS!!! And the QUANTITY DAYS ARE QUANTITY! Little-to-no match head! Recovery days are also just that - Recovery; there's no match head to speak of. Also notice that your Xert Progression Focus line is out there in the "GC Specialist" area. I am JUST fine with that, as, if you think about it - 8 minutes is a PRETTY AEROBIC effort. The Focus Spike was right before your breakthrough, and it settled down again after those two silver medals. We'll be attempting breakthroughs less frequently now, but when they come, they'll be "Big Silvers", as we develop the HIE capacity, and let FTP float up. IT will pull Lower Threshold. Capacity to do work comes in three places. Aerobic Capacity, Anaerobic Capacity, and Maximal Capacity. We don't worry too much about Maximal Capacity right now, but the HIE and Threshold continue to grow, and pull Lower Threshold Power up. You're identifying your TRUE HIE, which is fundamental to interval intensity and duration. You are also showing a GREAT, YAWNING GAP of Tempo Power, from 189 watts to 242 watts, which is what I like to call my "Post-Breakaway With 45k to go" power. Remember - I WANT YOU TO BE THE ONLY ONE IN THE PICTURE WHEN THE FINISH LINE COMES AROUND! All of that will rise as FTP and HIE go up. We'll also 'Push' Lower Threshold with LOOOOONG slow rides once the weather warms up where you are. Ramp Rate is rising steadily. Polarity ratio is improving. Fitness Signatures are trending in green, and Total XSS is showing a healthy bump as well. Weekly focus is right where you want it. We'll start with Ramp Rate. Outside of the week of the 18th, which is still okay at 7.2, look at what the simple act of Progression has built for you; a nice, steady Ramp up of XSS/Day volume. We've also seen improved Signatures because of this, and in the last two weeks, we've hovered near a 90:10 ratio through Friday of each week. I'm not concerned about smacking a 90:10 or greater for a whole week - THAT would take less volume, and would be too intense for this time of year. Look back at the Strain Chart, and you'll see that those Quality Days were so beautiful, and fun, that the Easy days ended up being easier, and longer, at higher levels of wattage and energy. Total XSS for the week ended at 669, and it's THAT number, along with the FOUR WEEKS of GROWTH, is what MIGHT necessitate a Periodization. NOT this week, but maybe NEXT week. We'll see how this goes as we progress. For the upcoming week, don't forget to try and RAISE your watts over the set time periods, and follow my "bank it, then spend it" philosophy. Think of it as half-wheeling from hell. We'll get appropriate dips in MPA, we'll see better colors in the "Focus" field, and we'll continue to see breakthroughs AS YOU SEE FIT! You're on your way, and I can't wait to see what the next two or three weeks bring you in terms of Signature, Volume, and Fatigue. Don't forget to do some resistance training, and if there are ANY twitches or warning signs from your hip, calves, or heart, we back down, and recover. No injuries. Train hard, Rest Harder. Looking for resistance training for endurance athletes? Buy Suspension Fitness today! Let's get to the root of this. I HATE that statement. “Better” is a completely loaded term. It implies perception over analysis, and it’s my job as a coach to be a shrink, a cheerleader, a gentle critic, a cajoler, and an overall positive influence. But what is NOT my job, is to DO THE ACTUAL WORK ON THE BIKE. YOU have to learn how to SUFFER! I have a client. Low overall Threshold, REALLY low overall HIE, and what I’d call an ARTIFICIALLY low Peak Power. I KNOW this client can do better. But this individual, and I’m going to be harsh here…. This individual DOES NOT KNOW, AND DOES NOT UNDERSTAND, HOW TO REALLY, TRULY, DEEPLY --- SUFFER. "I Can't Understand Why I'm not A Stronger Cyclist!" Do the Work - Reap the Reward. Suffering is GOOD at times. Training requires WORK. You USE ENERGY to GENERATE WATTS, and thus – GET FIT. FITNESS gives you the ability to use MORE energy, and generate MORE WATTS, and thus – GET MORE FIT! But when you don’t DO THE WORK, you don’t GENERATE the POWER, and your FITNESS STAGNATES. It really is that simple. Do the Work, Reap the Reward. This individual has everything; Great job, two great kids, expensive bike, extravagant components, custom wheels, Rapha Kit that gets replaced when bike grease inevitably shows up on a jersey pocket. The works. But what this person DOES NOT HAVE, is the ability to SUFFER! I tell my clients – “You have to suffer like a barefoot Russian in winter!” Hey – they beat Napoleon! You can, too! Well, there’s a time to suffer; it’s called interval days and it’s meant to be a controlled, “Focused” intensity. Do the work, reap the reward. But some people just…… either don’t want to, or don’t understand just how hard “Work” really is. "Volume IS Work! It's not ALL SUFFER(ing!)" I met with this individual, after they signed up for Xert. I helped them program the head unit. I explained the concept of volume, intensity, frequency, Focus, and fitness breakthroughs. For TEN WEEKS, this individual’s numbers JUST. KEPT. DROPPING. I couldn’t figure it out. Until Finally, it dawned on me to try ONE MORE THING. More KiloJoules gets you more fitness. And more suffering in a good way. Too MUCH intensity, and NOT ENOUGH VOLUME, can affect overall fitness. Xert Reveals More work yields greater returns. #ridemore. You can't go HARD all the time. Sometimes - you have to go LONG. Suffer slow sometimes. I prescribed MORE volume, in the “Green/Red” zone, on the days this individual was not in my studio. Working around the work schedule, we figured out how to essentially double capacity. It took time, but JUST LAST WEEK, it finally clicked. Volume yields fitness. Fitness yields breakthroughs. Breakthrough! Every Watt Counts! Every KiloJoule Counts! Now – I know this is NOT MUCH. But – it’s a start. And the fact is – this person has MUCH more ability than what the numbers show. But the light bulb switched on. It clicked. They finally “Got It”. Work the MPA using colored watts to pace yourself, and when slope or terrain changes, or intensity intervals change at the coach’s urging, GO FOR IT. Earn that breakthrough. It’ll help you. It’ll help me. It’ll help the system. You’ll learn how much more you can give of yourself, and when, and how long, and then work the recovery. Fitness is a game. Xert Fields on a Garmin head unit help you play that game. When it clicks, watch out, because the cycling will become that much more fun. I don’t request breakthroughs every time. That’s impossible. Oh, I do love seeing people who have been in my studio for years, break through their plateaus, and achieve more. On April 25th, 2018, I received an email from a past client. Joe had mostly come to the Cycling Center Dallas Studio for weekend FLASH rides, when the weather was too poor to ride outdoors. He was always a good cyclist, but beyond the 2 hours here and there, I did not know much about his ability as a cyclist or a competitor. Joe had not been to my studio recently enough to learn about my infatuation with Xert, the cycling fitness assessment model that has led my clients to such recent success. "Can you get me ready for 'Bike the Bricks'?" Bike the Bricks is held on the Friday of every Memorial Day Weekend. It's a really popular event that requires lots of anaerobic capacity. Bike the Bricks is a Criterium bike race, held on the Friday of Memorial Day weekend, in McKinney, Texas. It is usually the first day of up to five days straight of bike racing. Bike the Bricks, however, is the most popular and exciting, as it winds it's way through a bootleg-shaped course, in the middle of downtown McKinney. It's VERY spectator-friendly. Bike the bricks - literally! Four weeks is a really short time to prepare ANYONE for a competitive event, but I had another idea in mind. "Maybe? What type of Power Meter do you have?" "Excellent. What type of head unit do you use?" "I have a Garmin 520." "Okay - let's meet and assess your current training values, and then let's chat about the best strategy to take so you're best prepared." ASSESSMENT AND TRAINING - NO, ASSESSMENT AND TEACHING XERT! Now, anyone who has ridden or trained for a bike race knows that unless the athlete is already somewhat fit, not even a miracle can leave them prepared for the demands of a bike race, in such a short period of time. Yet I had a different idea in my head; if I could use the information offered up through Xert, then we could help the athlete BETTER UNDERSTAND his fitness, the dynamics of the race, when and how to attack, bridge, or recover, and even when a breakthrough might occur or be appropriate. Joe Gonzalez Performing his first Set of Tabata Intervals using Xert. Per my directions, the athlete showed up early, got a proper warmup, and using his verbal claim of Threshold/Critical Power, I plugged him in to PerfPro Studio, and gave him some of my nastiest intervals. Then, his Xert Fitness Signature was properly set. Over the next three weeks, I looked at the information that his power meter and head unit provided. It gave me the ability to better understand his fitness. I was better at planning the strategy of the workouts. Finally, I was better at helping him understand just what the head unit was telling him, through the use of the Xert Fields. Xert Fitness Signatures CAN and DO DROP as you change modes for different Focus. In this case, the cyclist changed his focus from Road Racing (Breakaway Specialist or Rouleur) to Crit Racing (Pursuiter or Puncheur), It also means he was just not as FOCUSED as he perhaps could have been earlier in the season. Now, an athlete might believe that this was a sign of less fitness. However, I believe it was a sign of a MORE ACCURATE FITNESS SIGNATURE! He DID achieve fitness breakthroughs, but the Xert Signatures, which used data from his winter and spring training, was tuning itself to the short, hard intensity intervals that I was providing the athlete. On the Tuesday before the race, I had the client come in for a final Fitness Signature Assessment. The result? Knowledge of HOW to time your intensity can lead to FITNESS BREAKTHROUGHS! NICE SIZED BUMP IN PERFORMANCE AND FITNESS CAPACITY - But even MORE important - KNOWLEDGE! Additionally, armed with this knowledge, and confident that it was accurate, the athlete and I then discussed how to use it in the upcoming race. We used ONE FIELD - Watts/MPA. When Watts turned black, he was above Threshold, at 270-383 watts. Above 383 watts, his watts were YELLOW, and he was on BORROWED time. If watts turned RED, he was above 770 watts when fresh, and he would not be able to sustain this power for more than 30 seconds. As the race wore on, fatigue set in, and MPA dropped, he could expect the colors on watts to turn yellow and red at LOWER intensities. He was to try and avoid a breakthrough for at least the first half of the race, and hopefully marshall his resources so he could use them in the last few laps, or at the finish. IF he saw yellow watts for too long, he should back off, and try to find a wheel to draft behind. If he was fresh, and the pack was slowing, he could take risks, or attempt a breakaway. To sum it all up; it all depended on the color of the watts, and the MPA values. He had learned that MPA was the key; if it dropped, he was riding VERY hard. If it rebounded, he was recovering. HE could make the race. Armed with this new knowledge, HE could attack, bridge, recover, lead out - anything. It was HIS fitness that mattered, not the random surges and recoveries of the Peloton. Next, we discussed hydration, staying cool in the heat and humidity, diet, carbo-loading, and teamwork, and I sent him off with my usual "Good Luck, but you don't need it! YOU HAVE SKILL AND TALENT AND KNOWLEDGE! USE THEM!" Unfortunately, I left the next day to attend a wedding in Northern Wisconsin, and was unable to attend the event itself. Because of poor cell coverage, I waited all day Friday for a text, and finally, in the late evening, it arrived. Results - 13th Place - his strongest finish ever! 13th Place, 40 finishers, 80 starters, and 2nd teammate of his club. Because of this KNOWLEDGE and APPLICATION, he had finished with the leaders. Joe had survived and done his part to activate the race. As a result, an Xert novice had used his knowledge on-screen and in the event, to help himself and his teammates. The cyclist had also achieved another breakthrough. Notice the SUPPRESSED MPA that then got DEPRESSED right at the mid-point? THAT was where the breakthrough happened, and it coincided with an attempt at a Prime. The rest of the race was relatively easier. "Relative" being the key word. There was no way that we could expect a podium. Thus, Four weeks of training had led to greater knowledge. It had not, however, been adequate to boost Anaerobic Capacity, or HIE to a significant degree. Perhaps more importantly, it led to a SMARTER RACER, and a SMARTER RACE. I think that's my most profound observation. The athlete, using Xert Fields and Fitness Signatures, was better able to RACE THE RACE, within his limits. He may not have been the most fit athlete out there. But he WAS the SMARTEST racer he could be, at that moment. For all the reasons I've mentioned above, I continue to be amazed. I am convinced that the Xert fitness signature and modeling are the most accurate system available. I've tried them all, I've used them all, and my athletes are now using Xert to greater and greater effect. You don't have to be a racer to enjoy Xert's fitness benefits. Understanding the fields, and the system behind those numbers, is very, very powerful. Perhaps most importantly, with this athlete in particular, we now know exactly where his strengths and weaknesses are. We will be addressing them throughout the summer. When the Fall Crits or the State Championship roll around, he will be even more prepared and confident in his fitness and capacity.